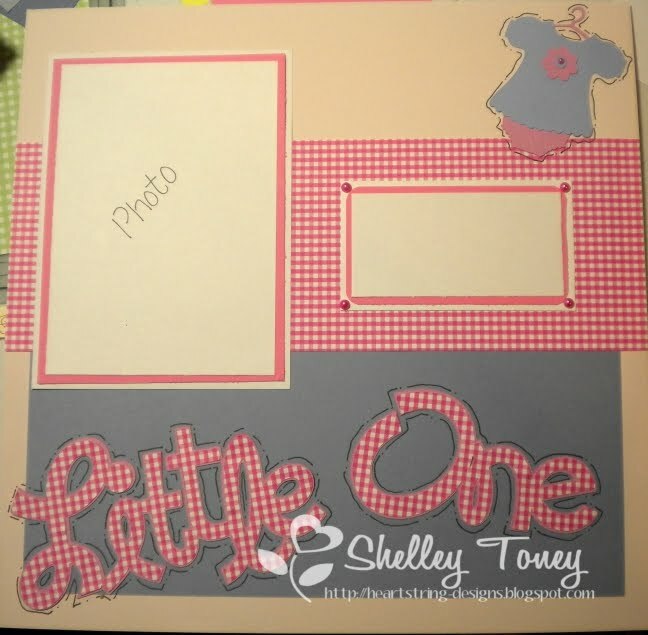 Shelley Bean: Baby Day...Coming Soon! This evening I decided I needed to give my Cricut some love because I haven't used it in quite awhile. It has been very difficult of late for me to focus on creating new projects for my blog...life has been SO hectic. Training for a new job that has my brain zapped completely, trying to get my stamps ready for selling, family reunions going on....and last but certainly NOT least, the due date of my darling 1st grandbaby just a couple weeks away. I need to get busy on making a home for all the fun photos I am going to want to scrap when she is born. Tonight I decided to peruse the New Arrival cricut cartridge, and it is SO CUTE! I made this simple page as a starter page for Brinnsen's new photo album. I am very rusty when it comes to scrapbooking. I would love lots of tips and ideas to make my pages a lot more interesting than this. But the cartridge is really cute, so it helped me out quite a bit! Tomorrow is the last day you can join us in the Red, White and Blue challenge. I would love to see a few more entries. Remember, there will be a prize awarded randomly to one of the entries....so your chances are quite excellent! We already have some very wonderful entries and I am so pleased with the participants that played along with us. And, there will be more upcoming challenges very soon...so stay tuned. The Design Team is gearing up for another fun-filled day VERY soon!! OH! And don't forget, if you mention our Design Team sent you when ordering any stamps from our sponsor My Heart Stamps For You, she will send you a FREE stamp with your purchase! This is so adorable! New Arrival is one of my favorites! Love the layout! COngrats on the new Grandbaby. I can just imagine your excitement. I can relate, things have been crazy hectic around here as well. So much stuff I need to get done, I have been home that much these past few days. I hope that things begin to slow down just a tid bit. Take care! ADORABLE!!!!!! I LOVE the colors!